After my post about Asparagus a few weeks ago, we received an email from Aly, in Florida who said she “grew up on asparagus and eggs as a breakfast, lunch or dinner option” and included the recipe below for a tasty asparagus and eggs dish. 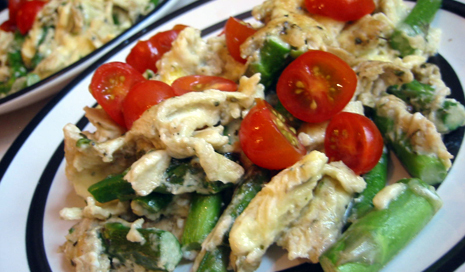 I loved the egg and asparagus combo and have made it several times already. It’s especially good with a little shredded local cheddar cheese over the top and a toasted slice of my favorite olive loaf bread from our farmer’s market. Saute some cut up asparagus in a small amount of olive oil and a couple of cloves of garlic, sprinkle some dried oregano, salt and pepper over it as it cooks. While the asparagus cooks, whisk 4 or 5 eggs in a bowl, adding a little milk. Thanks for the recipe Aly! Do you have a favorite tip or recipe you would like to share? Go ahead and send it our way, we’ll give it a whirl in our “test kitchen” and if we like it, we just may post about it! i made asparagus bread pudding a couple weeks ago and it was delicious! which is basically just asparagus, eggs, bread, and cheese. mmm. I have been loving my morning asparagus & egg combination the last few weeks – it is a great way to get some greens in during the early hours – try a scramble with egg, asparagus, and a bit of crab it’s perfect! This recipe looks fantastic. I have some leftover asparagus from my farmer’s market, so I will have to try this tomorrow morning.